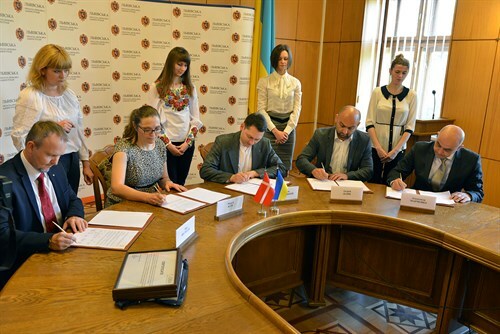 On May 21, 2015, The Danish Ambassador to Ukraine, Merete Juhl and the President of Danish Business Association, Lars Vestbjerg signed a memorandum on cooperation with Lviv Regional State Administration, Lviv State Tax Administration (LOSA) and Lviv Custom Office. During the meeting the Ambassador talked about intentions to cooperate and develop relationships, both in business and in the cultural field. The great level of activites Danish businesses have in Lviv Region demands good and safe cooperation. LOSA supported the Ambassador Extraordinary and Plenipotentiary to create safe inviroment for Danish Investments in the region. Under the cooperation the parties build relationships based on integrity and security partnership interests of each party, a regime of maximum promotion of mutually beneficial plans. In order to study and improve the investment climate in the region, improving the labor market situation, the formation of human resources and to create jobs for young professionals in enterprises with participation of foreign investors in the Lviv region , organized within its competence, seminars and information events . This memorandum also provides support for business contacts and conducts all necessary measures to ensure effective cooperation.